Many types of spontaneous population activities, including gamma oscillations and sharp-wave-ripple activity, cannot be reliably generated in acute brain slices in vitro when maintained in submerged conditions. While some alternative approaches have been proposed, interface-type chambers are still the optimal preparation to study spontaneous and stationary local field potential activities in slices. However, commercially available designs were not conceived to be used under the microscope and therefore visual patch cannot be obtained. Here, I describe our design for an upright microscope-coupled interface chamber. This design was adapted and developed from an original idea by Ivan Cohen, in the laboratory of Richard Miles in Paris. Our chamber was produced by Lagoplast (Madrid, Spain), who has all our designs and prototypes for different configurations, including a chamber adapted for human hippocampal slices. Chamber design : The chamber was designed in methacrylate to fit into an Olympus BX51W microscope. To this purpose we adapted dimensions so that the microscope condenser could freely move to focus (z axis), while also living room for adjusting the microscope position relative to the chamber (xy axis). The chamber has a double walled cylinder to be filled with a solution (either distilled water or the recording solution) that is warmed and bubbled with 95% oxygen-5% carbon dioxide gas. To warm this solution we use two silicone rubber heaters (Minco, HR5209R4.6L12B). To bubble the solution we use in house made aireators with standard silicone tubes. The recording chamber consists in a cylinder, topped with a removable ring that holds a mesh for placing the slices. The bottom of the chamber is transparent enough to allow for light to adequately illuminate the sample. In more recent prototypes we actually glued a glass cover slip to improve visibility. The top of the chamber is sealed with a removable cap, which creates a cavity for saturated and moistened gas mixture over the slice. This cap has some openings to facilitate coming with the glass pipette with an angle while maintaining the gas cavity as much enclosed as possible. 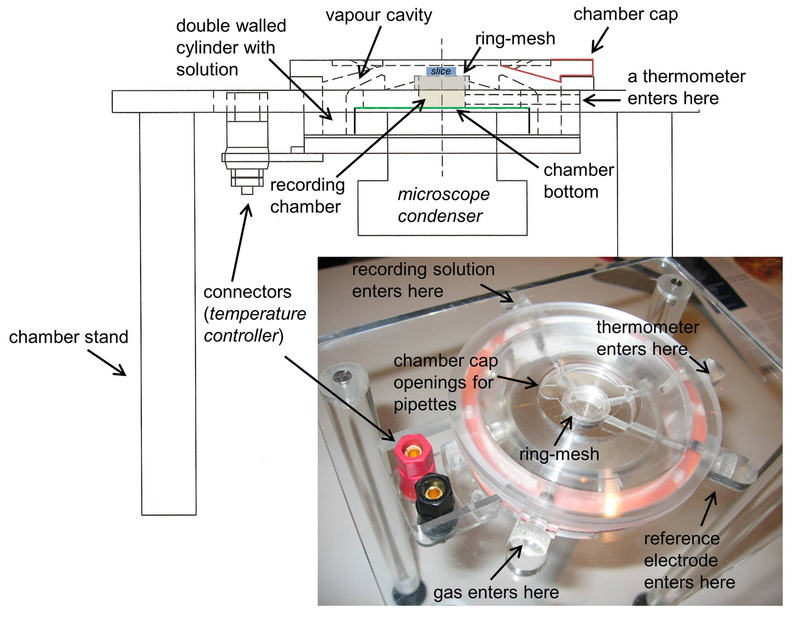 Temperature is maintained with a controlled system that heats the silicone rubber bands under the control of a thermometer at the recording chamber. Installation: The chamber is installed in a stainless still stand under the microscope. The design is conceived to have some slots to enter the thermometer, the reference electrode and the recording solution into the chamber. These slots are sealed with silicone once the devices are in place. The recording solution enters the chamber through an oxygen impermeable Tygon® tube (R-3603, ref EW-06408-60 from Cole-Parmer), which spirals in the heated solution before entering the upper part of the chamber where the slice lies in a mesh. To close the chamber hermetically, and to avoid vapour coming out the chamber and damaging the setup, we use an annular piece of paper as a seal. The solution is removed from the top with a syringe needle coupled to a perfusion pump that maintains a flow rate of 3 ml/min. 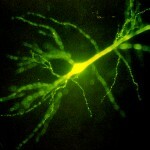 Neuron visualization is performed using a long working distance dry objective (LUC PlanFLN, 40x, Olympus) that we warmed at 32ºC to avoid vapor condensation. Maintenance: The chamber needs to be cleaned daily. After each experiment, the cap is removed and the chamber is emptied and rinsing with distilled water.